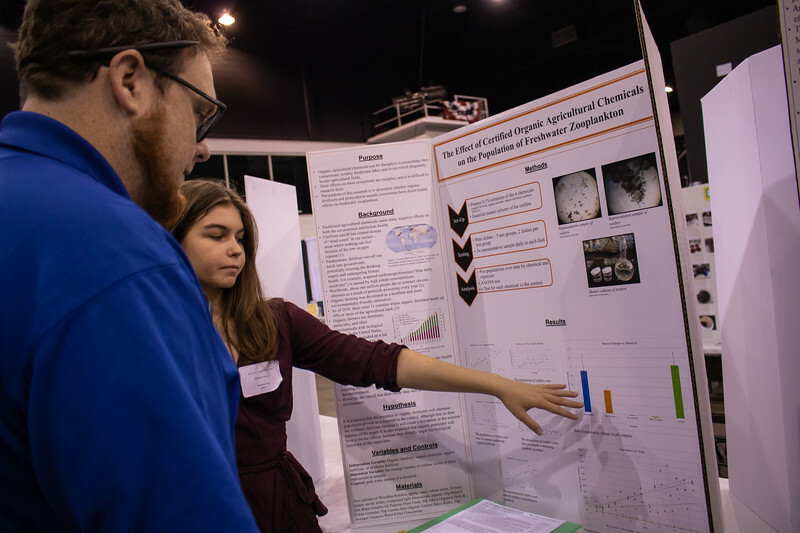 New College’s Travis Hardin judges Sarasota High student Elizabeth Abbott’s project at the Sarasota County STEM Fair Jan. 30 at Robarts Arena. New College staff recently volunteered as judges to encourage the next generation of scientists and researchers at the Sarasota County Science, Technology, Engineering and Math (STEM) Fair. Marina Mangie, the marketing coordinator for admissions, and Travis Hardin, New College’s assistant director of new student recruitment, joined other professionals, educators and scientists who evaluated 250 high school and middle school entries, as well as 400 projects from elementary school students Jan. 30-31. They arrived at Robarts Arena, where students had set up their project boards the day before. Event organizers briefed judges on procedures. The judges then learned which projects they would be evaluating and examined thedisplays, log books and supporting research materials the fair required each student to provide. Armed with notes and questions, the judges waited for the school buses to arrive. The students soon filed in, taking their places beside their display boards. Marina Mangie, admissions marketing coordinator at New College, talks with Marcos Bautista, a ninth-grader at Suncoast Polytechnical High School in Sarasota about his STEM Fair project, that compared the effectiveness of a popular weed killer with nontoxic alternatives. Mangie spent several minutes with Marcos Bautista, a ninth grader at Suncoast Polytechnical High School in Sarasota, about his STEM Fair project, which compared the effectiveness of Roundup, a popular but toxic weed killer, with nontoxic alternatives. He said he got the idea for his project from his father. “My dad’s a landscaper. Roundup is expensive, and it’s not good for my dad.” He set up patches of weeds and compared Roundup’s ability to kill them with household concoctions containing ingredients such as salt, vinegar and Diet Coke. His findings showed some of the homemade herbicides worked just as well, and some even better, than the commercial product. — Jim DeLa is digital communications coordinator for New College of Florida.